HM693-001, Niagara Bar Cabinet, by Howard Miller. 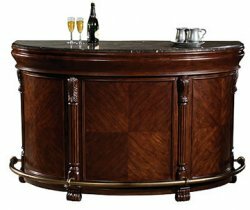 The Niagara bar cabinet is a half-moon shaped wine bar with laminated Italian marble top. A piece of wine furniture that will add a luxurious look to your home. Niagara Bar Stool (HM697-001): The brown leather seat features metal support springs & antique brass-finished foot rest. Bar Stools are generally only sold & shipped with the purchase of the bar. Please inquire about shipping rates if ordered on their own. Beautifully crafted line of spirits and wine furniture. Howard Miller offers a variety of styles and sizes of wood wine cabinets including the beautifully designed line of hide a bar cabinets. Please note these cabinets are not climate controlled. These fine wood wine cabinets and wine storage bars enhance and complement the display of prized collectibles with features such as locking doors, mirrored backs, adjustable glass shelves, and halogen lighting. The construction quality of any piece of fine wine furniture largely depends on the joints used. At Howard Miller, they believe that a fine wine cabinet is no stronger than its weakest joint. Assemblies that are subject to stress are doweled and glued under pressure. To assist in strengthening our cabinets, Howard Miller averages the use of 30 screws and 45 dowels in each cabinet. NO OTHER MANUFACTURER OF COLLECTORS CABINETS CAN MAKE THIS CLAIM. Howard Miller prides itself on having one of the finest finishes available in the entire furniture industry. To do this they use a multi-step process in the finishing of each Collector Wine Cabinet. This process starts with extensive machine and hand sanding of the cabinet prior to it even entering their Finishing Department. Once in their Finishing Department, the cabinet is stained, sealed, sanded, glazed, highlighted, and multiple coats of lacquer are applied. The process is then completed with a hand rubbing wash and polish. Howard Miller carefully selects finish technicians and trains them specifically for each step in this process. The finishing process is very labor intensive, with each case receiving the best possible finish, depending upon its individual wood character and the styling of the case. Simply put, Howard Miller Collectors Cabinets have an heirloom finish built to last generations. Adjustable levelers under all four corners level cabinet on any floor. No-Reach‚ ™ On/Off Switch for cabinets with lights, conveniently located on the back of the cabinet. New, cushioned metal safety shelf clips for added stability. Adjustable Glass Shelves, numerous adjustment within your cabinet. Front or Side Locking Doors - Feel confident that your valuable collectibles are secure. Halogen Lighting - A brighter, whiter, more natural light that better illuminates collectibles. Recessed, Fitted and Screwed Back, strengthens the cabinet and provides a pleasing appearance from the side. Beveled Glass on many cabinets, a beautiful addition that softly frames your collectibles. Lock Pull, a decorative addition that makes opening and closing the door easier. All Howard Miller Wine & Spirits cabinets & Wine Bars are available for shipping throughout the United States and Canada. Howard Miller wine furniture is top quality, non-refrigerated wine products. Distributed from offices in Zeeland, MI, Michigan, USA, 49464 and North Carolina, 95122. YES, our rates are for GOLD LEVEL SERVICE DELIVERY! Inside delivery to room of choice & uncrating. We offer discounted GOLD LEVEL delivery service on most of our Howard Miller Cabinets! GOLD LEVEL DELIVERY - Inside main floor delivery & uncrating. Additional charges will apply if you are located in remote location or your delivery parameters are extreme. Shipped directly from the manufacturer. Please also see our returns policy or Shipping Tab for more information about shipping or returns. GOLD LEVEL - White Glove Delivery is for US and Canada. Includes main floor delivery of cabinet and positioning in place, uncrating & removal of packaging. 2 deliverymen needed. Additional charges will apply if you are located in remote location or your delivery parameters are extreme. Canadian shipping cost indicated is to major Canadian city. Extra charges may apply within Canada for smaller towns or remote locations. All Brokerage, Duties & importation fees are already included in your delivery/product price. We will ship you new replacement items immediately, at no charge, as long as you indicated on the waybill that there was damage. We insure all items we ship, however, in order to make a claim it must be started within 7 business days of shipping. For an item where Free Shipping, $1 Shipping or a Shipping Credit is provided: if the product needs to be arbitrarily returned, you will be responsible for the Full Cost of Original Delivery as well as any return delivery charges and possible restocking fee. The Full Cost of Original Delivery will be determined by independent third party and will be applied to credit provided. For Howard Miller Cabinets - should the customer need to return the cabinet or is unable to accept delivery; the customer will be responsible for the return delivery cost as well as FULL cost of initial delivery. Actual initial delivery cost will be valued as $328, $366 or $420 as indicated on Howard Miller rate sheets and this is what we are actually charged for delivery. However, we only charge you the amount indicated above. The restocking fee may still apply.